It is very important for the new Aventura to use a suitable memory card! These should correspond to a special specification otherwise they will not be read by the device! Attached is a photo of a 64Gb SD card from another brand that has been successfully tested. Some files and folders have been renamed, which even leads to the uselessness of the mosaic map on a compatible SD card, see picture-1 above and how it should look right see picture-2. 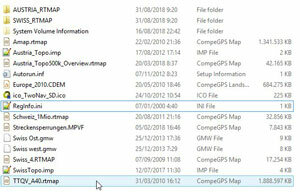 Furthermore, all maps are stored in a folder Maps, this is not necessary, these can be transferred directly to the SD card. These are the BROTECT® AirGlass® Premium laminated glass film clear for TwoNav Aventura (2018). It is: Extra Hard, Ultralight, Highly transparent, Anti-Fingerprint and offers a bubble-free installation. I once posted the LINK to the respective shop page here. The delivery within Germany and also Austria is free! 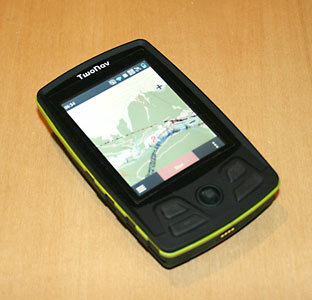 This Spanish manufacturer even offers a full screen display and according to the manufacturer's website, "The best screen protector for your GPS, Invisible Shield, available for Velo, Horizon, Aventura/Trail, Anima and Anima +, Twonav Ultra"
For more information about the providers, please click on the links to open the information!